The enduring “Winnie the Pooh” is a timeless, sweet and innocent children’s movie for the younger set that’s based on the beloved books written by A.A. Milne and illustrated by E.H. Shepard in the late 1920s. Pooh Bear and his forest friends all live in the Hundred Acre Wood along with Christopher Robin, a ten-year-old boy. The film combines hand drawn illustrations while intertwining pages of the storybook with the film’s action. A pleasant respite from the typical children’s films that are heavily animated with darkening 3-D, fast paced action, special effects and random adult humor. You’ll find none of that in “Winnie the Pooh.” What you may be surprised to find is a creative, hand-drawn film painted with a soothing watercolor palate; one filled with catchy songs, childhood themes and down to earth fun. Children will certainly understand and connect with this “Winnie the Pooh.” I can highly recommend this film for families and consider it ‘the top film of all time’ to be enjoyed safely by grandparents along side their grandchildren for generations to come. 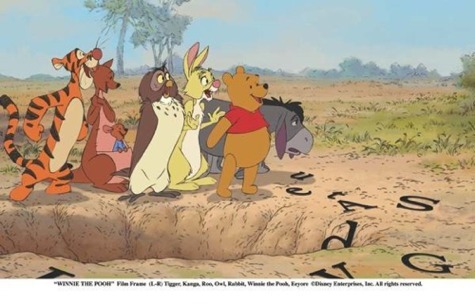 Pooh’s friends Piglet, Tigger, Rabbit, Owl, Kanga, Roo and Eeyore are all featured in the film and have fairly equal screen time. The story takes place on a single day and begins like every day; Pooh wakes up and is craving honey. Most of the film revolves around his pooch-y, growling tummy that has a one-track mind, which brings viewers to laughter at its sight. The forest friends all have individual and distinct personalities and they are played out well. Piglet is self doubting, nervous and unsure most of the time, wringing his hands continually while lamenting over a problem. Pooh is a true friend and tries to boost Piglet’s confidence, as friends do. The friendship aspects ring loud and clear in the film, sending a great message to kids. Wonderful examples of kindness and sharing are displayed with also teach in an understated tone. Craig Ferguson’s voice as Owl is perfect. He’s the one creating all the problems after misreading a note from Christopher Robin. Instead of reading that he’d be back soon, Owl tells the group that Christopher Robin’s been kidnapped by a scary creature named Backson. This is all happening while the forest friends are looking for the down in the dumps Eeyore’s tail. The musical score and songs are lively and blend well with the story. I was surprised by how many songs were in the film, but they served a good purpose in expanding the themes. I particularly liked “A Very Important Thing To Do,” performed by Zooey Deschanel. Bottom-line: A calm, slower paced, fun film that should charm the socks off families while entertaining them in a unique way, without all the bells and whistles of CGI and 3D. 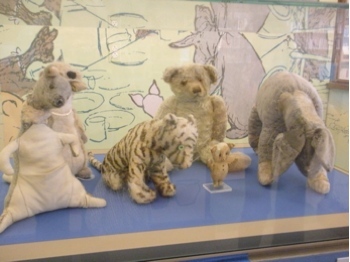 Backstage Note: If you are interested in viewing the original stuffed animals, they can be seen in the children’s section of the New York Public Library (as pictured below).